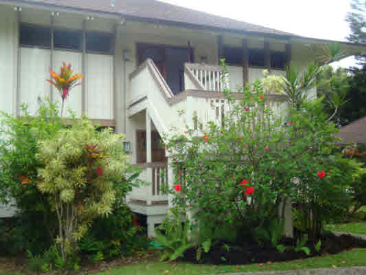 A great buy on a bank-owned (REO) Property in Princeville. This first floor end condominium offers views out to a tree-lined path to Anini Beach and beyond to the Prince Golf Course. 1058 square feet with one bedroom and 2 baths. This is a great floor plan that gives you lots of flexibility. Start with a large entry. Then on one side you have a kitchen, dining and living area and bathroom. On the other side is a bedroom/sitting area with a full bathroom. You can live in the entire condo, or live in one side and rent the other. Or rent out each side separately. Two lanais. Tiled floors throughout. Bathrooms have been remodelled. The condominium needs work. Princeville Paniolo is a small condominium complex of 26 units (11 buildings) located in Princeville, Kauai that were built in 1979.